Drunk Nothings: Chrissy is that you? 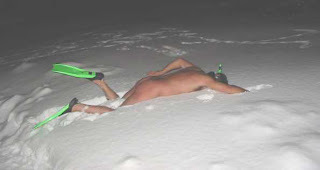 Now I'm not saying that this guy was drunk BUT HE IS SWIMMING IN THE SNOW. I mean cold water gives you shrinkage what the hell does snow give you?? A 3rd testicle? ?